DFWCityhomes is an established flat fee MLS listing service and full service real estate company that represents buyers and sellers in Mansfield, Texas at a fraction of the cost. Our clients receive a full service experience with agent representation at all service levels and our simplified process is hassle free, proven, and effective. Interested in learning more? Click MLS Listing Services or Buyer Rebate Services to see how we may help you. Contact Us or Call (214)-207-0210 and we will explain to you how our services can save you time and money. Mansfield, Texas, Is an affluent suburban city located mostly in Tarrant county, with small parts in Ellis, Johnson and Dallas counties in the state of Texas. It is a suburb of the Dallas-Fort Worth Metroplex area. Its location is almost equidistant to Dallas, Fort Worth and DFW Airport. As of the 2010 census, the population was 56,368. The population is estimated to grow from 59,831 in 2012 and projected to reach 70,019 in 2017. Mansfield is a dynamic, growing community with a rich history and a bright future. In its more than 100 years Mansfield has developed from a rural, farming community to a bustling suburban city of more than 60,000 people. Yet despite the explosive growth this city has seen in recent years, Mansfield has not lost its friendly atmosphere or its small-town feel. With a quality of life considered to be one of the best in the Metroplex, This city offers more than 500 acres of parkland, a historic downtown area, recreational opportunities for young and old, superior rated schools, quality housing and a growing business community. 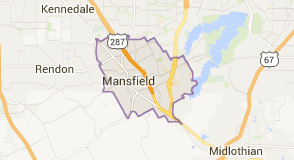 CNN/Money Magazine ranked Mansfield at #17 in 2014 in its annual "Best Places To Live" list. Mansfield has been in that list in the recent past: in 2007, 2009, and 2012, ranking it 83rd, 24th, and 30th, respectively.